The University of Houston-Downtown (UHD) recently received a $2.748 million Title V grant to support its “Accelerated Transfer Program,” which will provide transfer students with enhanced advising, coaching and clear pathways to complete their bachelor’s degrees. The grant from the U.S. Department of Education’s Developing Hispanic-Serving Institutions (DHSI) Program will also support UHD’s Accelerated Transfer Program in improving articulation agreements between the university and community college partners. 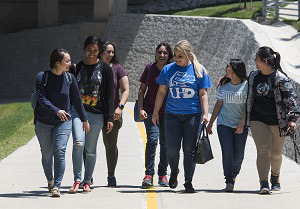 University officials believe the efforts of the transfer program will “significantly increase” persistence and on-time degree completion at UHD. The latest Title V award is the third received by UHD in the last six years. An award in 2012 supported Project STAR, a program that focused on student transition and retention. A 2015 grant award supported the Pathways to Teaching Careers Program.